In a night full of twists and turns, it’d be Jordan Latimer getting his first career Sauble Falls Tent and Trailer Park Late Model feature victory on Saturday night at Sunset Speedway. Following the first 35-lapper on the night, Paul Maltese started pole ahead of Taylor Holdaway, Brittney Gresel, Travis Hallyburton, Chris Morrow, Jordan Latimer, Dwayne Baker, Rick Spencer-Walt, Al Inglis, and Billy Zardo. Gord Shepherd started 11th, followed by Nick Goetz, Ron Quesnelle, Thayne Hallyburton, Danny Benedict, Lane Zardo, Mike Wilkinson, Ernie Fumerton, Kendra Adams, and Jordan Lawrence. Holdaway jumped out to the early lead, with Maltese and Travis Hallyburton side-by-side for second ahead of Latimer, as Gresel and Spencer-Walt went side-by-side for fifth. Hallyburton got the runner-up position on Lap 2 ahead of Maltese, Latimer, with Spencer-Walt clearing Gresel two laps later. Latimer then got alongside Maltese for third on Lap 5, completing the pass a lap later, with Spencer-Walt looking to follow him through. At the front of the field, Hallyburton tracked down Holdaway, getting alongside him for the top spot ahead of Latimer, Spencer-Walt, Maltese and Gresel. They’d battle all the way until the first caution flew on Lap 9 for Gresel spinning in turns one and two. With 27 laps to go, Hallyburton led Holdaway, Latimer, Spencer-Walt, Gresel, Goetz, Morrow, Baker, Thayne Hallyburton, Billy Zardo, Fumerton, Inglis, and Lane Zardo. The restart saw Maltese get sideways down the backstretch, with Goetz and Baker making contact behind him, resulting in heavy front end damage for Baker going into turn three. There’d also others be collected in the incident – whether slight damage or spinning, including Lane Zardo, Billy Zardo, Wilkinson, Adams, and Gresel. With everything cycled out, Travis Hallyburton still led ahead of Holdaway, Latimer, and Spencer-Walt, with Morrow now up to fifth ahead of Thayne Hallyburton, Billy Zardo, Shepherd, Inglis, Lawrence, Lane Zardo, Wilkinson, Quesnelle, Gresel, Fumerton, Adams, Maltese, Goetz, and Benedict. The restart saw a continuation of the battle for the lead between Travis Hallyburton and Holdaway, with Holdaway getting the top spot on Lap 13 ahead of Hallyburton, Latimer, Spencer-Walt, Thayne Hallyburton, Morrow, and Shepherd. The caution flew once again, though, for Fumerton and Quesnelle getting together in turns three and four, collecting Maltese. Holdaway got a good restart ahead of Hallyburton and Spencer-Walt, but Hallyburton got right back alongside Holdaway for the lead a lap later. Behind them, Spencer-Walt and Latimer went side-by-side for third, with Latimer getting the spot on Lap 18 as Thayne Hallyburton looked to follow him through ahead of Lawrence. Latimer would clear Spencer-Walt for third just as the caution flew own Lap 21 for debris in turn four, as the rear bumper fell off Fumerton’s car. 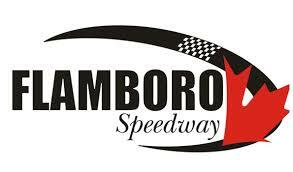 With 15 laps to go, Travis Hallyburton led Holdaway, Latimer, Spencer-Walt, Thayne Hallyburton, Lawrence, Fumerton, Wilkinson, Billy Zardo, Inglis, Lane Zardo, Goetz, and Maltese. Holdaway got a good restart to grab the lead ahead of Travis Hallyburton, Latimer and Spencer-Walt as Lawrence battled Thayne Hallyburton for fifth. Lawrence got the spot on Lap 24 ahead of Thayne, as Shepherd and Wilkinson went side-by-side for seventh. Travis would get back alongside Holdaway for the lead with 10 laps to go, completing the pass one lap later. Latimer continued to run third now ahead of Lawrence, Spencer-Walt, Thayne Hallyburton, Shepherd, Wilkinson and Inglis as the Zardo brothers battled for 10th ahead of Goetz. Shepherd continued to move forward, passing Hallyburton for sixth on Lap 30, with Billy Zardo clearing Lane Zardo for 10th. The caution then flew with five laps to go for Gresel spinning in turn three. The restart saw a battle for the top spot between Travis Hallyburton and Holdaway, with Holdaway going around for the spin in turn two. Hallyburton was deemed involved, and therefore sent to the back for the restart. With three laps to go, Lawrence now led ahead of Latimer, Shepherd, Spencer-Walt, Wilkinson, Thayne Hallyburton, Billy Zardo, Inglis, Lane Zardo, Quesnelle, Goetz, Maltese, Benedict, Adams, and Morrow. Jo Lawrence got a good restart, leading the rest of the way en route to crossing the finish line first. However, in post-race technical inspection, he was disqualified, resulting in him loosing the victory. Jordan Latimer would get credited with his first career feature victory ahead of Gord Shepherd, Rick Spencer-Walt, Thayne Hallyburton, and Mike Wilkinson. Al Inglis finished sixth, followed by Nick Goetz, Billy Zardo, Lane Zardo, and Paul Maltese. Ron Quesnelle finished 11th, followed by Danny Benedict, Chris Morrow, Ernie Fumerton, and Taylor Holdaway. Kendra Adams finished 16th, followed by Travis Hallyburton, Brittney Gresel, and Dwayne Baker.